I first went to Staffordshire in February 2019. I hope to go back sometime and find some more St Mary's (maybe it will be warm and sunny next time!). Click on a picture to read a bit more about the church (and maybe see more pictures of me!). I was a bit grey in the original photo here, but Uncle Les did some of his magic and now I am positively glowing (must remember to enhance the splendid fur). Mind you, I had to sit on a wheelie bin for my photo ('nuff said). 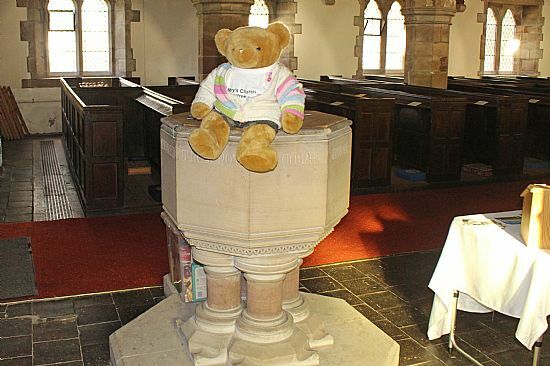 Sadly the church is only open for visitors after Easter - I couldn't wait that long! 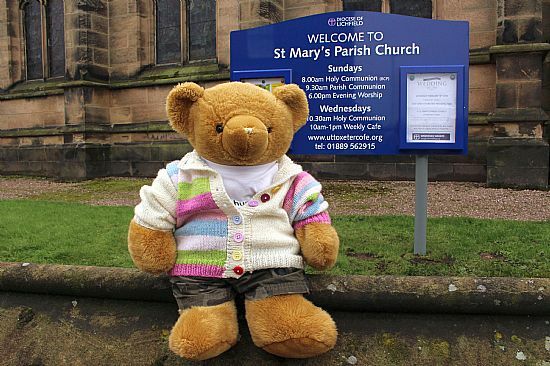 This St Mary's was s'posed to be open in February - it said so on the gate - but it wasn't. The SatNav lady didn't know where this village was so it took some finding. 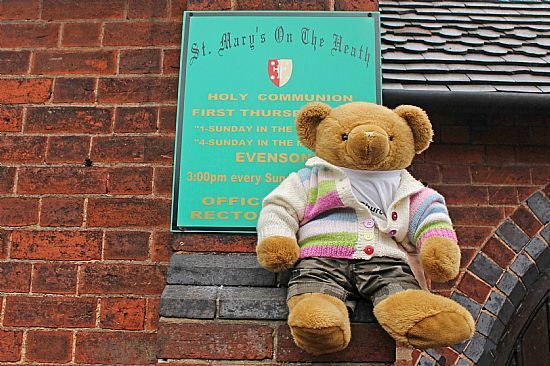 This St Mary's has a car park though, which was handy. 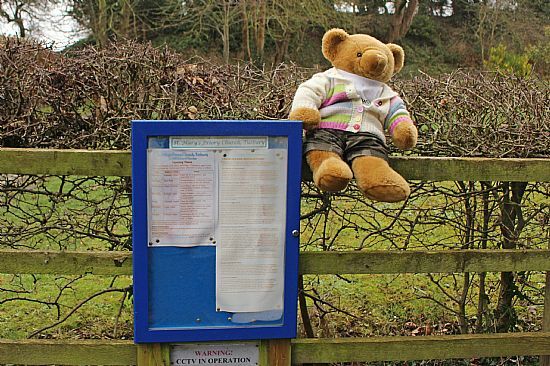 It also has a splendid noticeboard. You see how I'm precariously balanced on a rail, well shortly afterwards there was an "incident", I may need to have a bath! The church has this rather splendid seat in the churchyard too. 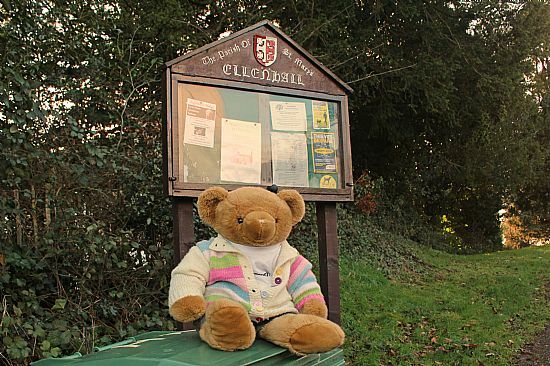 I had a quick sit down on it, but the weather was rather too chilly and damp for a serious snooze. 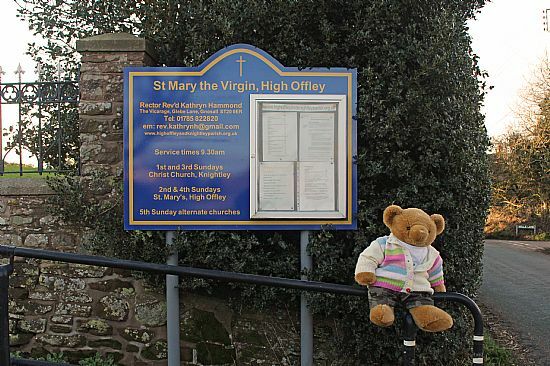 I know this Sy Mary's is actually in Derbyshire, it will be corrected. We nearly missed this St Mary's while driving through the village, and then it popped up behind us. Isn't that odd?! (I blame inattentive assistants - I was having a snooze and so couldn't be held responsible). We got to go inside as well and we had a good look round. This was another St Mary's that was hiding in a village. It's quite a big church, and we could see it, but we couldn't get to it in the car (I didn't want to walk 'cos it was raining). We finally got near and I had my photo taken but I'm not sure this is the proper noticeboard. 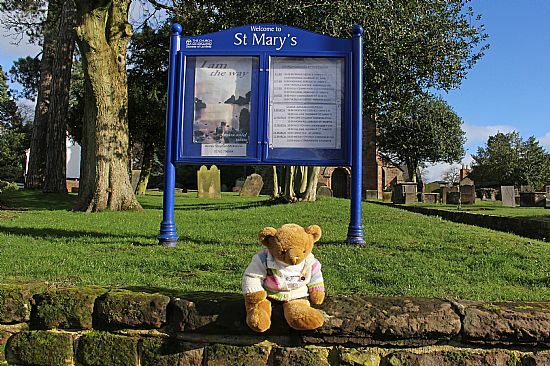 Uttoxeter is confusing - it has two St Mary's churches, this one (which is the main Parish Church) and another little one called St Mary's on the Heath (which I also visited, but two days later). This church was lovely and friendly and I had a good look round. They also have a Wednesday lunchtime cafe that my assistants took advantage of (Sausage & Mash and a mug of tea - excellent). 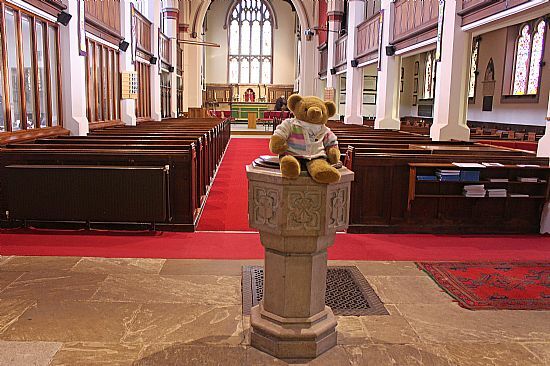 This is the other St Mary's in Uttoxeter. It's really small and is called St Mary's on the Heath ('cos that's the bit of Uttoxeter where it is). It's right on the edge of the road (there's no pavement) so it's a bit tricky to visit.